The Broke Dog received a discount on a custom Henry ornament in exchange for a blog feature. This post may also include affliate links. If you’re anything like me, you can’t resist anything with your pup’s face on it! I love discovering new artists who understand just how irresistible it is to celebrate our pets this way. We interviewed Som, the owner and artist behind Peony Peacock Studio, about her gorgeous hand-painted jewelry, accessories, and ornaments — including one with Henry on it! Keep reading to learn more about her shop and how to save 10% off your own order until the end of November! I am located in Jersey City, NJ right across the Hudson from New York City. I’ve been selling my art since 2007, though it was more of a part-time thing that I pursued on the side back then. The nature of my work has also evolved a lot since then. I have always been a hand painting artist but did more of nature themes, fabric art, and art on other mediums before I started my hand painted jewelry. The pet portrait line is just about a year old and I’m immensely happy to have found my niche in it. My business is a source of pure joy and an avenue for the fulfillment of my dreams, which are pursuing my art and being a stay home mom to my almost 4 year old girl. I love painting for my clients; the joy I feel when a pet mama gleams with excitement over her personalized dog/cat jewelry is priceless! I immensely enjoy doing custom work, as I get to interact with my clients a lot more and also learn along the way. Currently, I sell hand painted jewelry that includes pet portrait jewelry (pendant necklaces, bracelets, key chains, earrings, bookmarks), accessories (purses), pet portraits on canvas, etc. Very soon, my line will be expanding to offer cards, mugs, art prints, and more. 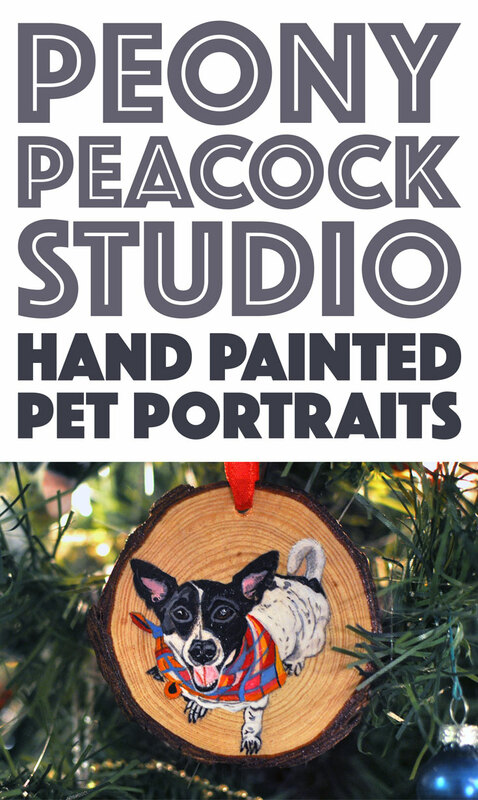 New items that I’m extremely excited about and that are just in time for the Holidays, are my custom pet portrait ornaments. These are just the perfect keepsakes to cherish one’s fur baby/babies. Beautifully painted with lots of attention to detail on wood slices, these ornaments make great decorations for your tree or to gift a loved one! I do not own any pets at the moment, but plan on getting a small pup next year as my lil girl grows up and is ready for one! I am primarily the sole hands behind my business and so very proud of it! I am the artist/designer, the photographer, the person behind packaging, shipping, and everything else there is. I am thankful to my supportive husband and darling daughter to be able to do what I do! I’d love to have the opportunity to create for you – I feel honored to paint your precious pup or kitty and make you a keepsake to cherish him or her forever! I am currently offering a Holiday pre-order special of 10% off regular pricing through November. Enjoy coupon “FBDISC10” at check out on my Etsy shop: www.peonypeacockstudio.etsy.com. Use code FBDISC10 to take 10% off your order at Peony Peacock Studio through November 2016! These hand-painted portraits would make the perfect give for your dog-loving friend or family member. I can’t wait to celebrate our holiday season with Henry’s ornament hanging from the tree! Which item would you order with your pet’s portrait on it?